The silly badass-teacher-cleans-up-school subgenre has always gotten a bad wrap, but for some reason I am often quite fond of them. 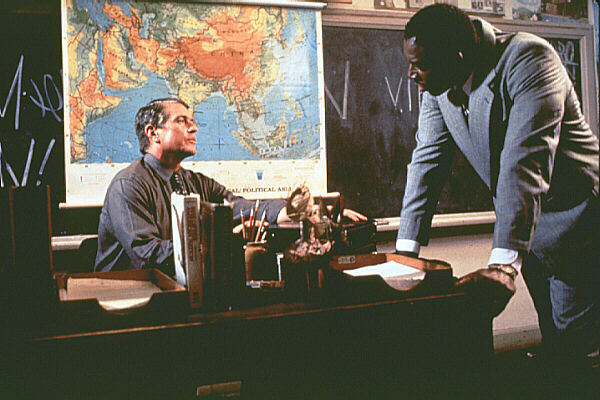 The Substitute would probably make one hell of a double feature with The Principal, although it might be one that only I would enjoy with any enthusiasm. This was my first viewing of The Substitute in a few years and I was surprised by how much I still enjoyed it, even though it isn’t particularly accomplished cinematically (and is sometimes downright sloppy) or smart at avoiding clichés and genre expectations. What it does very well is set up a general air of silliness and wry humor, while sometimes slipping a scene of poignancy – although mostly thanks the performances from Berenger and Venora. I also don’t think it is particularly inappropriate to find The Substitute as a conservative white-male piece of wish-fulfillment, in much the way Joel Schumacher’s Falling Down was three years earlier. The film paints high schools as a war zone and suggests that the ideal teacher of troubled kids in the inner cities are mercenaries. It also builds up an antagonistic black principal (well played by Ernie Hudson) who seems to be the film’s critique of liberalism: concerned more with displaying his power indirectly (he breaks a paddle each year, but criticizes Berenger’s Smith for his self-defense assault on a student) and establishing liberal programs (daycare for students with children) but finally reveals him to be only interested in self-achievements – both financial gains through drug-deals and eventual political aspirations. None of which is necessarily a demerit to the film, but interesting to note in terms of changing tides of media representation in the last ten years. Also the idea of relying so heavily upon mercenaries to do our bidding instead of public officials more relevant in this era of “independent military contractors” being relied upon heavily in the current Iraq war, the commerciality of which the film comments on with one of the mercenaries showing a cheesy reel of his notable actions to a prospective buyer.